One thing you will quickly learn being over in Asia is that Asians love baseball! We learned that Korea is no exception and decided to catch a game. 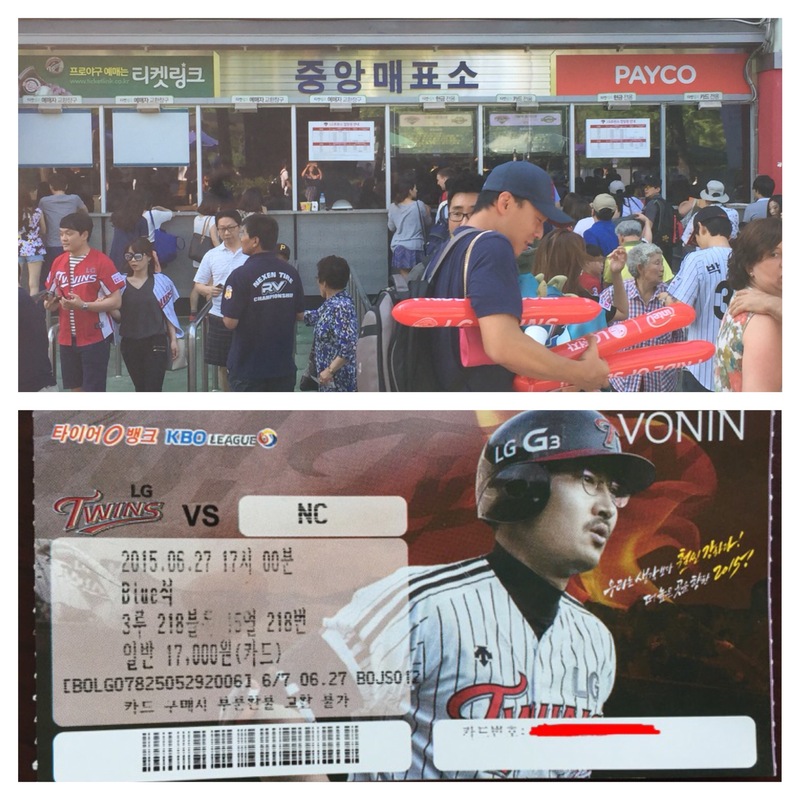 We were able to watch the LG Twins take on the NC Dinos. So the first thing you need to know about attending a baseball game in Seoul is that unless you are a Korean Resident, you can’t buy tickets online (they require your resident card number). So that means for most, you will be buying tickets at the ticket booth outside the stadium. The ticket booth is located right outside of exit 5 of the Sports Complex Station. When you get in line, make sure you ask for tickets together and try to get tickets on the 1st base line (as that is in the shade). Trust me the 3rd base line gets HOT!! Also, try to get tickets in the cheering section, this is usually the most rowdy and fun section. I suggest that you get there 30 minutes – 1 hour early for weekend games as they sometimes sell out (I hear that buying tickets off of people on the street isn’t recommended). Buying tickets at the box office is very simple and employees speak very good english. The second thing you will need to know is that the stadium is divided up by what team you are rooting for. The home team is on the 1st base line and everyone wearing the home team colors will be sitting on this side. Then you have the away team which is on the 3rd base line and everyone is wearing the away team colors. So make sure you plan in advance for the side you want to sit on as they don’t really let you mix. The next thing you need to know is that you can take food and drinks into the stadium. So you can bring your own beer (no hard liquor is allowed), food and snacks! You can pick up a box of fried chicken outside of the stadium (KFC is the only fried chicken place inside), Grilled Octopus, or even some Octopus Jerky! All the typical stadium foods right? 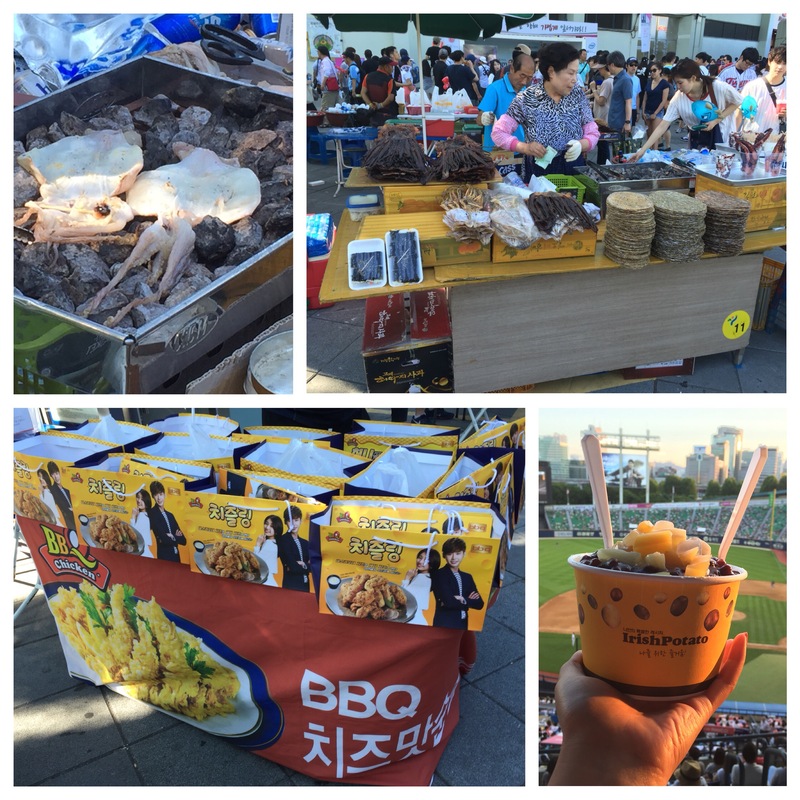 My favorite is that they serve Bingsoo in the stadium. Say hi to the Male Cheerleader who leads the cheering section! And here are the lady cheerleaders, bouncing around to all different kinds of cheers. There is constant cheering for your team. 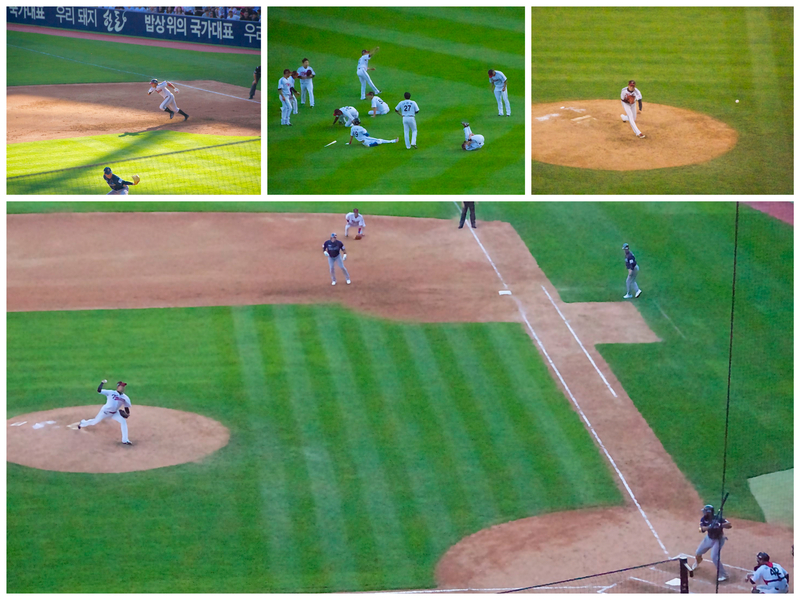 I’m not a huge baseball lover, but there is literally something for everyone at a Korean baseball game, you might even learn some cheers! There were times when we were so caught up in the action in the stands that we didn’t even realize that the inning had started. So even if you aren’t a huge baseball fan, don’t hesitate to grab some friends and head out to the ball park.